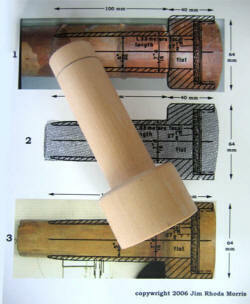 Galileo Telescope Making a Museum Quality Replica for Adler Planetrium of Galileo's IMSS 2427 paper covered Instrument. Below probably the most historically important yet unheralded telescope in the progress of science One of Galileo's development instruments as it would have appeared when new. A simple telescope no decorations, paper covered, split wooden tubes, wired wrapped to keep halves together. 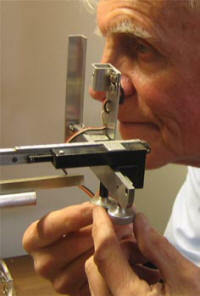 The lenses and apertures are easily replaced, held in with wire snap rings. etc. Michelle Nichols Master Educator Adler Planetarium & Astronomy Museum in Chicago Illinois checking out Adler's new replica of Galileo's telescope IMSS 2427. which we made precisely to the specifications of Galileo's original telescope( note 10). There is no antiquing here. It appears and works as the instruments he was using in his famous work of searching, interpreting, and educating. While Ms. Nichols is running the preliminary test of the telescope's performance, scanning the down town skyline of Chicago from the Adler Planetarium. We three are intently discussing the challenges Galileo faced as he was searching the heavens with his telescope and marveling at Galileo skills as an experimentalist. 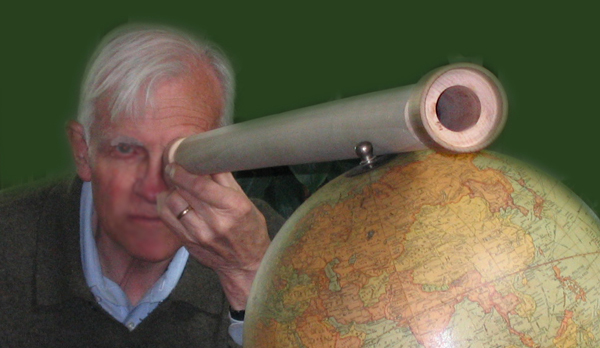 Click here for a picture and short technical discussion and demonstration of what it is like to look through Galileo's telescope. Adler Planetarium a fortress of knowledge With its extraordinary collection of very beautiful astronomical instruments old and new and hands on displays of how they work. Plus the best view of the famous Chicago sky line. Above a specially constructed eyepiece lens holder for the IMSS # 2427 using a positive eyepiece lens a Kepler 1611 design) giving a larger field of view. We changed the focal length from 100 to 50 mm increasing the instrument power to over 26. We also have made the eyepiece extra long which allows the telescope to focus to less than 50 feet so that it might be used inside a large room. IMSS 2427 half telescope mounted on stand showing all the details of the inner world of Galileo's development telescope. The eyepiece can slide in and out. 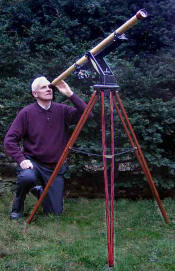 Throw a light shield over the telescope and it can be used. "In order to maintain and increase the renown of these discoveries, it appears to me necessary to have the truth seen and recognized, by means of the effect itself, by as many people as possible. I have done, and am doing, this in Venice and Padua. But "spyglasses" that are most exquisite and capable of showing all the observations are very rare, and among the sixty that I have made, at great cost and effort, I have been able to find only a very small number. These few, however, I have planned to send to great princes, and in particular to the relatives of the Most Serene Grand Duke. And already I have been asked for instruments] by the Most Serene Duke of Bavaria and the Elector of Cologne, and also by the Most Illustrious and Reverend Cardinal Del Monte, to whom I shall send [spyglasses] as soon as possible, together with the treatise. My desire would be to send them also to France, Spain, Poland, Austria, Mantua, Modena, Urbino, and wherever else it would please His Most Serene Highness." Click here For more about Galileo's intuitive understanding of the big issues of science and trust. 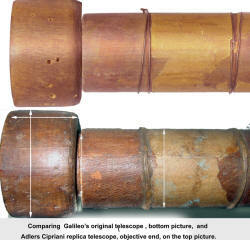 Museum grade clones of both of Galileo's Telescopes. We are also providing accessories and half models to demonstrate the details of their internal construction. Galileo as a technologist is one of the purist case studies we can use to help us understand the dramatic role that basic scientific research plays in our health, society, business, religion, culture. and the health of our planet. Galileo's world of how science is done 400 years ago is not very different from today. Basically, there are greater numbers of people, and we have a substantially increased speed of communication of accurate and inaccurate information. The cost of basic research which was born by the Dukes and Princes in the 1600’s is still paid for today by our governments. Schools and museums are still responsible for teaching us the truths of science. Interesting not enough citizens understand the science of science. Galileo's model of teaching is almost universally accepted (to some not nearly enough). We would make one small update in his definition of truths. We would include not only what we see in the telescopes but to see how the world of science really works, remembering that there are no words powerful enough to express the importance of basic scientific research. So by studying the scientific career of Galileo Galilei, along with a very accurate replication of his instruments, experiments, methods, materials, and funding or any part there of we can significantly improve our understanding of the very heart of science. Again we say Galileo Galilei strongly favored this approach. Today it is even more important because of the increased strength of the impact of science on all of us. Current topics Stem cell, Global Warming basic research etc. need our understanding of the science of science. Museums like the Adler Planetarium bring you to the instrument of science and connect you to their history and to your future. 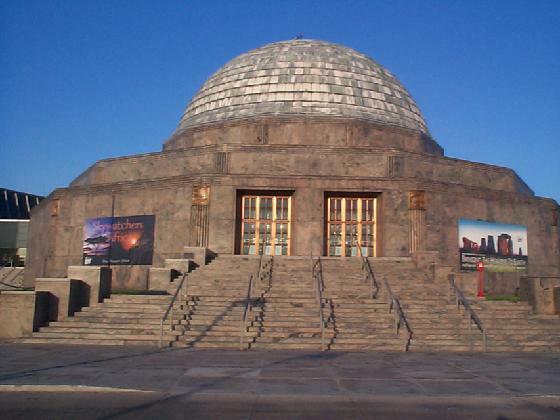 The Adler Planetarium is a must place to visit They have a magnificent collection of Astronomical instruments on display. Lots of things to do and see. 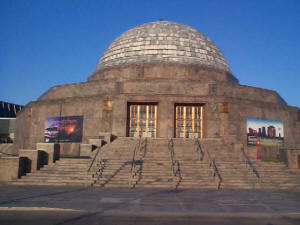 Its a very interactive place, fun to visit, learn, and play The Planetarium is located on a man made island with a spectacular view of the Chicago's skyline. 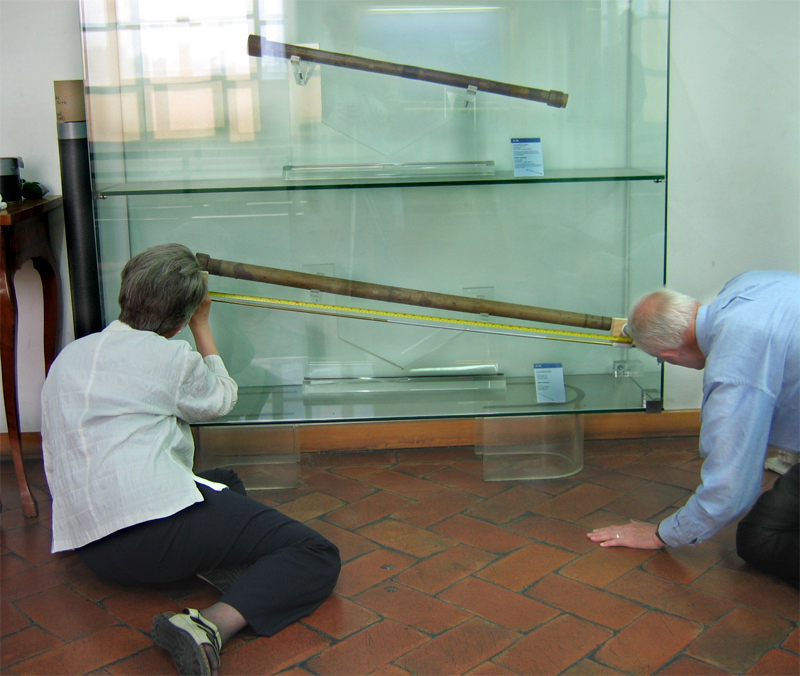 The two telescopes attributive to Galileo now at IMSS in Florence Italy and the two precise replicas we made of them. 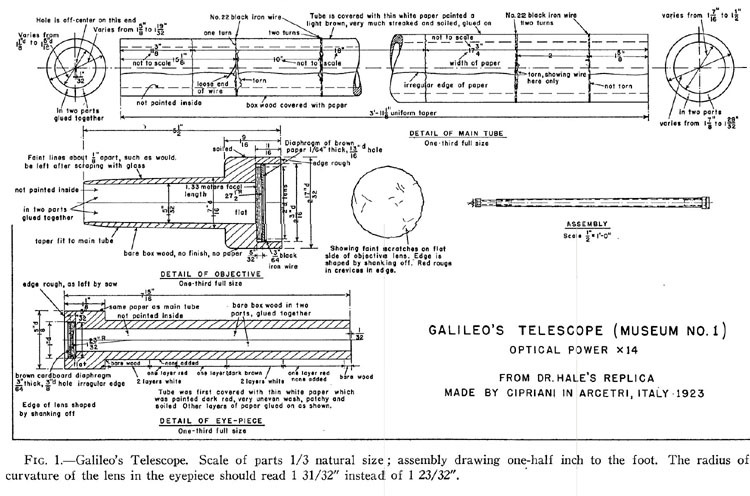 This web page has our details of the replication of Galileo's experimental telescope which we made For Adler's Planetarium. You can see the original at Florance Italy. 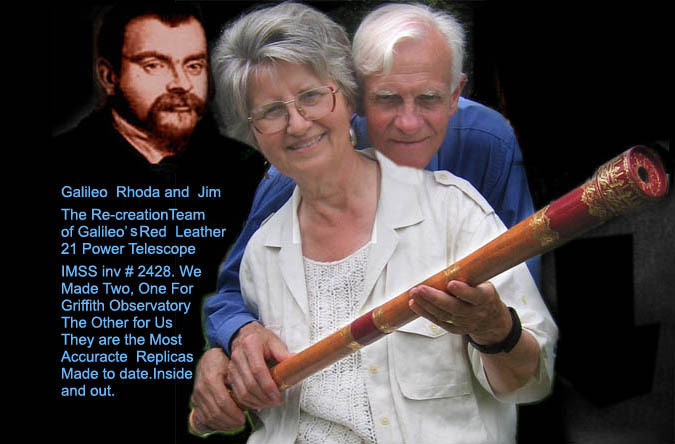 to go to the web site which has the details of the replication of Galileo's red leather presentation style telescope that we made For Griffith Observatory. You can see the original at IMSS at Florance Italy. No Words are Powerful Enough to Express the Importance of Basic Scientific Research To Each of Us and Our Children. click on photo above to see larger version then click on that photo to make it even larger. Building Museum Grade Replicas of the Telescopes attributed to Galileo. These telescopes have a valuable story to tell. To some they are like the holy grail of science. By looking at how they were designed, the materials used, and the methods of manufacturing gives us a window into the past through which we can tell allot about Galileo his colleagues as technologist, as marketer, the sources of funding, and the politics of politics. They are delightful teaching tools of what science is all about. 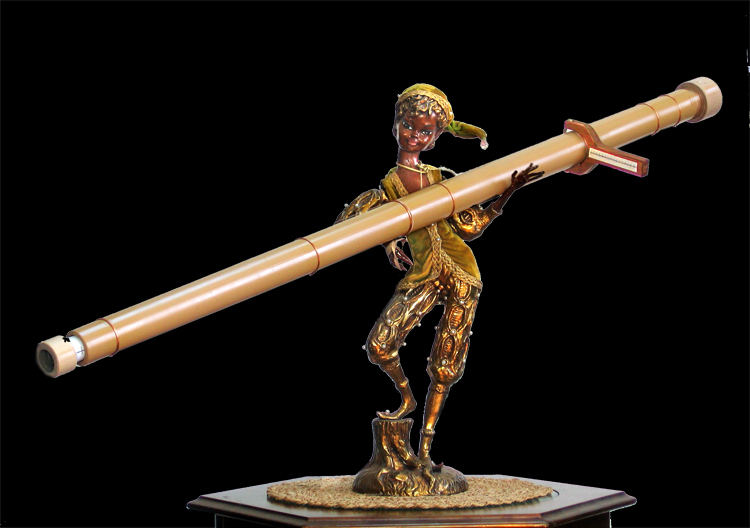 Replication has its challenges especially if one attempts to reproduce the telescopes as they would have looked like new, a panoply of ornamentation and craftsmanship. One can not use the originals as a sole reference source. They have a moving legacy of stresses left from normal aging, neglect, untold restorations, and mistakes in their inventorial process. It is not a project that can be taken lightly These Telescopes are internationally important symbols teaching us about how basic scientific research works including the struggles that it faces. They therefore deserve careful attention to every detail in their replication including resolving as many of the uncertain issues as possible. Replication requires considerable first hand experience in the experimental arts of the relevant science. In Galileo's case, knowledge in product development is also important because Galileo had business commitments designing and manufacturing military and scientific instruments. These forces are not always taken into account in determining how Galileo designed his instrument. An example, to a replicator with product development experience. the choice of negative versus positive eyepiece lenses which Galileo made in developing his telescope was more likely to have been a marketing consideration rather than a scientific one. 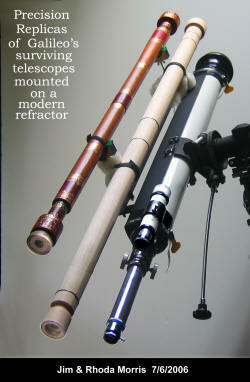 Replicating these telescopes as in all scientific issues accuracy is a prime goal. One has to be cautious in using data from those chroniclers' of such literature that is written in a spiced up way to make their work more saleable for personal gain. Creditable museum grade replication requires time consuming research. 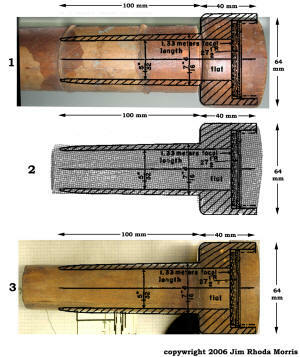 Even the best reference material including the item being replicated carry mistakes many of which are reborn every time a new paper about them or replica is issued. Galileo and his telescopes are no exceptions. There is no lack of questionable papers about him and his instruments in which typographical or measurement errors have been created and repeated when copying earlier references that are not based on prime sources. We were determined to reduce the number of the uncertainties. 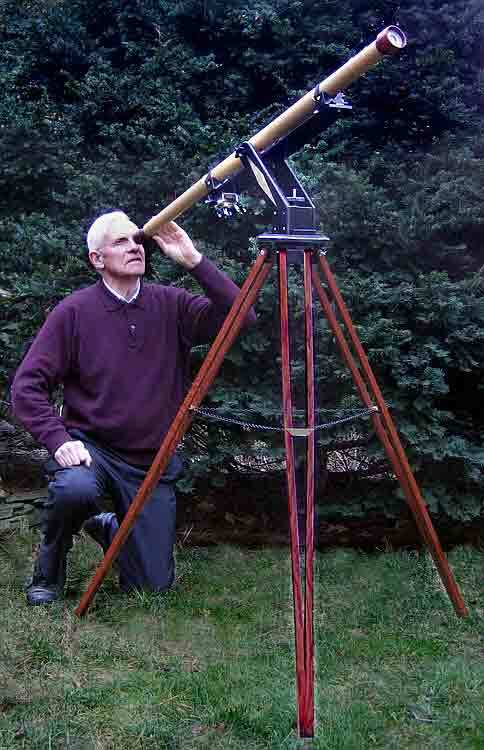 We believe that we have achieved this and that our replicas have established a new standard of accuracy in the reproduction of these extraordinary telescopes. 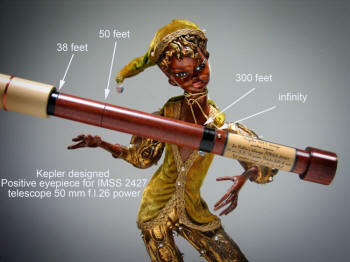 We have been able to this because of the patience and very professional help of the staff at IMSS in Florence Italy where the telescopes are on display, the staff of the Griffith Observatory for their sponsorship of replicating IMSS INV # 2428, and the staff of Adler Planetarium for their sponsorship of replicating the IMSS INV # 2427 and by giving us access to their very interesting replicas made by Cipriani. All have made it possible for us to make measurements and make high resolution photos of the originals and some of Cipriani's replica telescopes. They also have shared their considerable experience of these instruments with us. 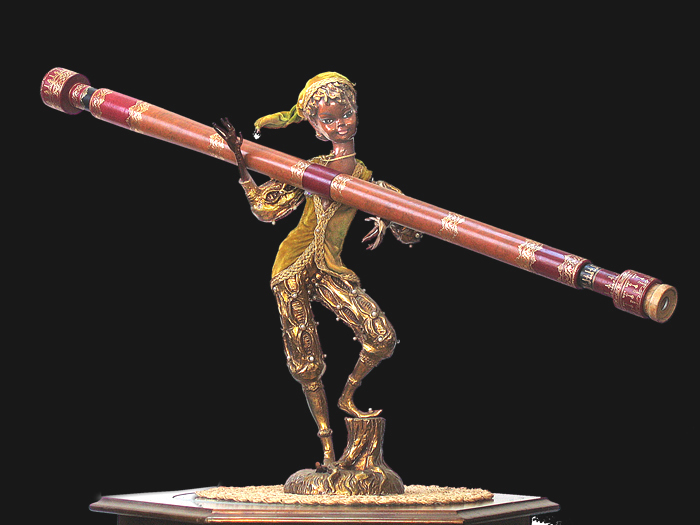 We found It absolutely essential to have had access to these wonderful instruments to make the necessary measurements to aid in resolving a number of important differences in the data for dimensions and materials in the published literature and the existing replicas from the originals. We made concerted effort in checking and cross checking our data in resolving these differences. 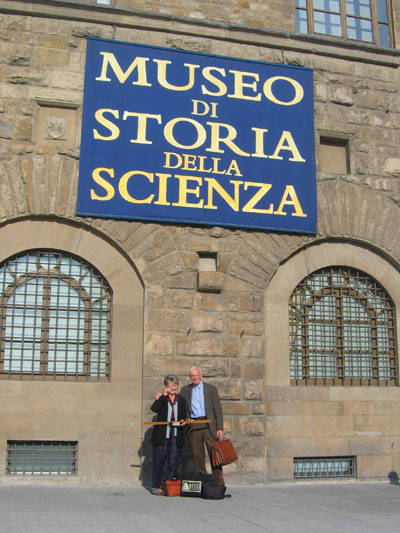 Below is a typical photo of a set of over a 100 taken by the authors of Galileo's Number 1 and 2 telescopes at the lovely IMSS in Florence Italy. The one below is of the objective end of the original number 1 scope. 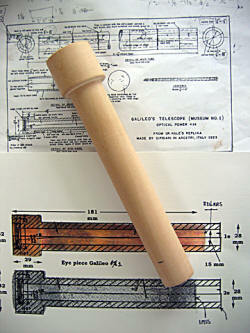 It shows the main barrel is made from two halves of wood . In addition to shows the two halves glued and wired together and covered with paper which has been painted and falling off. It shows the scraping of the wood surface by the builder. We used it to help to establish a set of the dimensions which we have used in comparing it with replicas made by Cipriani ref #1. and in building our replica. In the process of making the Replica of Galileo #1 telescope for Adler Planetarium We have been making comparisons of data from five sources for the physical dimensions of the instrument to get the highest assurance within our grasp to make as faithful replication of the Galileo telescopes to within our resources. 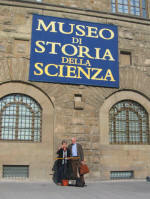 1, We have our photos and measurements which we made of the orginal telescopes in Florence the last quarter of 2005. 3, There is the data from Van Helden ref 2 IMSS inv. # 2427 which give measurements and photos. The latter may also have come from IMSS staff. These data tend to agree with our photos, measurements for number 1 telescope IMSS inv. # 2427, and IMSS photos. 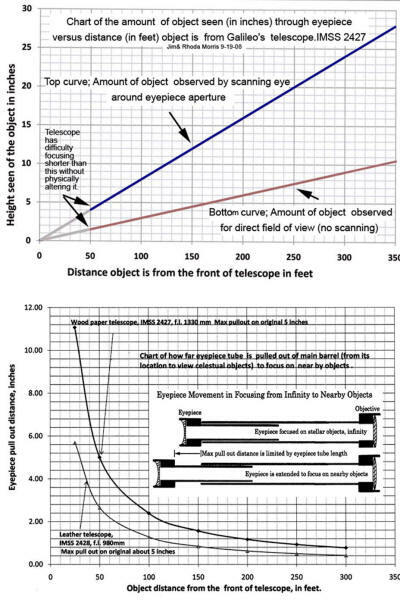 But We have noted differences when comparing Van Helden's measurements of the eyepiece and the overall length of the telescope number 2, IMSS inv #2428 the leather telescope. We have data once removed from the original from two replicas made by Cipriani c 1920-1940 who had access to the original instruments. These data not only gives us information about the original instruments as it might have looked at that time but has given us the opportunity to measure Cipriani reproducibly in copying them. . We have found differences in two of his replicas which we are not comfortable with. 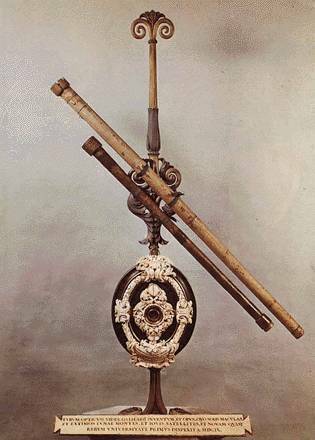 The latter is interesting because Cipriani replicas telescopes are being used to make other replicas that show up in museum's and popular literature. We have measured and photographed last quarter 2005 the replica made by Cipriani for Adler Planetarium and Museum. c 1930 to, I believe to celebrate the planetarium opening? We are using data from a 1939 paper by Edison Pettit Astronomical Society Of The Pacific. Pettit says it is a drawing of a replica made by Cipriani at Arcetri brought to Pasadena by Dr Hale 1923. One would hope that Cipriani would have taken greater care in this replication because it was being made for a famous astronomer. A typical comparison of these data for the objective. is shown in the photo at the right. The top image is from our photos of the original. We have over laid on these photos line drawings from the work of Pettit of Hale's replica by Cipriani. Our choice of dimensions are being taken where possible from data of the original, The difference noted are in the 1%, or 1 mm range. It is interesting to see how close Cipriani's Hale replica's come to our photo of the original. There are differences between the individual replicas when compare to each other. 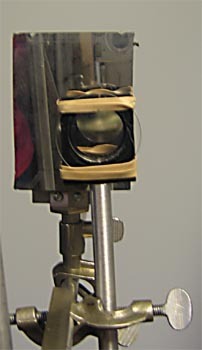 The Adler Cipriani is longer and smaller in diameter at the junction point between the lens holder and the sliding tube than the data from the original and the drawings in Pettit's paper. We used the IMSS comparison. in length the rest are in good agreement. Reproduced here is a copy of a drawing from a paper by Edison Pettit, published in the Astronomical Society of the Pacific 51 (June 1939) 147-150. (#301) (replica by Cipriani presumably for Dr. Hale of Pasadena Ca. ). 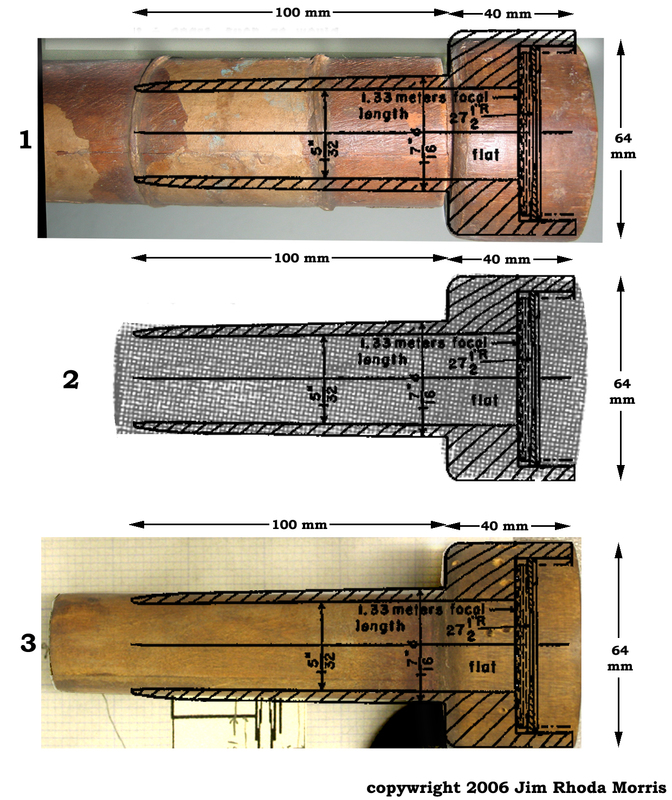 There are different in these drawing from our measurements especially the insertion lengths and diameters of the insertion tubes some which are noted above in the figures and with those described in ref 2, There are difference in th number and composition of the wires holding the telescope together. Ref 6, Damage to the objective tube recently restored. Direct comparison of the surface detail of the objective end of Adler's Cipriani replica with the orginal at IMSS Florence . The original looks as though it had a rough finish with lots of scrape marks on the visible wood which was covered with paper to hide it. It looks like the two halves of the barrel came un-glued and were wired together with the wire on top of the paper. The original has extra material semi transparent covering the wires . The colors are somewhat different. 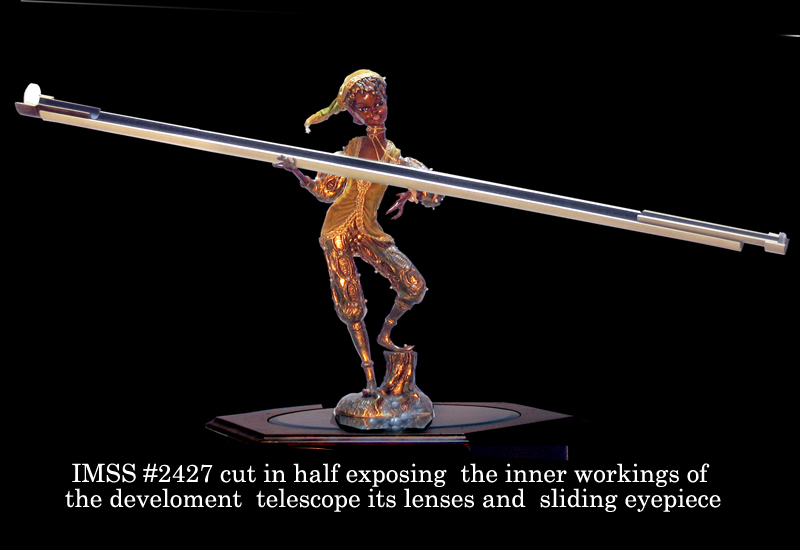 Can one use Galileo's two telescopes in doors? Yes depending on the size of the room. The bottom graph shows the diameter of an object which would fill the field of view seen in the telescope versus distance from the telescope. 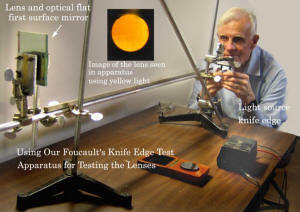 We're using the specifications for the optics as described in the Reference by Greco etal., Applied Optics 1 Nov 1993 / Vol. 32, No. 31. The objective is a biconvex lens with a focal length of 1330 mm and a diameter of 51 mm. 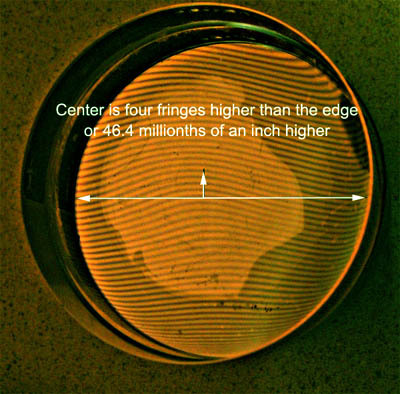 and a plano concave lens with a focal length of -94.0 and a diameter of 26 mm..
We tested the polishing machine using a 2 inch diameter 1/8" thick plane glass blank. with 4 minutes of polishing we took off about 46.4 millionths of an inch and converted it to a convex surface. The photo above shows the interferogram of our glass blank with the interference lines use to get this measurement. It's going in the right direction with reasonable speed. All we have to do is get good spherical surface and not overshoot the focal length of 980 mm. Lens polishing /grinding machine that we've put together for this project. We are going to use it in an attempt to polish down the focal length of the 1000mm lenses to 980 mm. Telescope mounts for our replicas. The philosophy behind their design and the details of construction. Click on the picture above to see the construction details of the tripod we made for Adler Planetarium. It is vaguely similar to those used in the 1600's. There is no polar mount modern bearings azimuth and altitude rings, and the solidness. We did added a simple fine motion control of our design for those who are tired of roughing it as Galileo did just to home in on an image and track it. 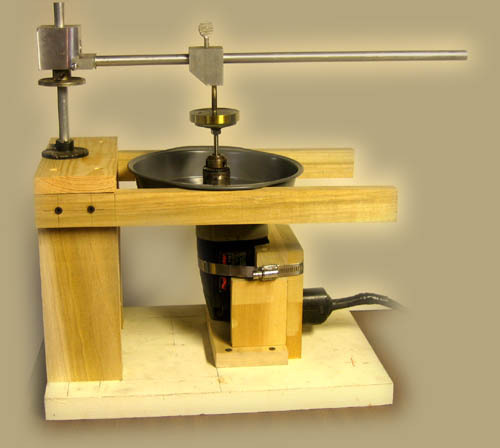 Click on the photo above to see the simple construction details of a mount we designed to hold both of our replicas on to a modern refractor with its polar mount , aiming scope, slow motion controls, azimuth and altitude rings. It useful for the observer to get a quick comparison between 1610 and today technologies . one can quickly compare the four telescopes in terns of brightness, field of view, the an range of image distortions. This is of course at the expense of loosing the tough realism that Galileo faced with out all the modern improvements including bearings etc. A Telescope of Galileo by Edison Pettit Astronomical Society Of The Pacific. 51 (June 1939) 147-150. Galileo estimates the number of telescopes he made or had made as 60. We of course are operating with information we have accumulated to date some 400 years after the fact. We discuss this issue in some detail further on our web sites. The three dimensions of science without them there is only darkness. There Are No Words Powerful Enough to Express the Importance of Basic Scientific Research: however, Galileo Galilei, using his scientific intuition, has shown us a way of looking behind the scenes seeing the untold world of science, a world very few have ever explored. Galilean Syndrome. Document 1.a. A written or printed paper that bears the original, official, or legal form of something and can be used to furnish decisive evidence or information. b. Something, such as a recording a photograph, ( text, equations, sketch, drawing, schematic etc. ) that can be used to furnish evidence or information. c. A writing that contains information. (The product of a basic research scientist's ).